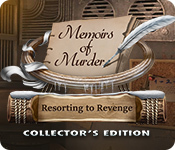 Memoirs of Murder: Resorting to Revenge Collector's Edition is rated 3.2 out of 5 by 33. Rated 4 out of 5 by Janetto from Fun Detective Story I played the previous Memoirs of Murder game and decided to purchase this one as well. It's a fun game about a married couple who wind up being amateur detectives. Happy to note there are no demons, witches, evil spirits, or goblins in sight. The only reason I didn't give it 5 stars is because there is an overabundance of mini-games/puzzles. Rated 4 out of 5 by Masanders from Why only 4 stars??? I really liked this game. I bought the first game in the series as a standard game. I like looking for souvenirs and morphing items so I got the collector's version of the second game in the series. I got all the way through the game, finding all of the morphing objects and then began finding the souvenirs. Unfortunately, one of the train cars is located in a scene of the game that let you scroll sideways during earlier game play. Looking for the souvenir though, you aren't given the arrow that will let you scroll to the side of the scene that has the train car in it. Requesting a hint will SHOW you the left arrow, but you can't actually GET the arrow that will take you to the left side of the scene. Hopefully. Eipix will issue a fix for this soon. I really want that last train car. Rated 4 out of 5 by coopers1950 from Archery problem Was doing OK, getting near the end then I have to shoot targets. There is no SKIP and I cannot line them up. Don't know if I am doing something wrong but I can't get past this game. Bored now. Rated 4 out of 5 by pixie30 from Enjoyed the trial I read some reviews before trying this game. The reviews werent very positive but i actually enjoyed the trial so i have used my 2 game credits to buy it. So far, so good. Rated 4 out of 5 by pgillenw from I Was Enjoying the Game Then . . . I was having fun playing the game and thinking how grateful I was for not being dished up another weird mystical characters of monster types. Tired of those game. Big problem I had reached close to the end of the main game. I'm in the trophy room and I must shoot the targets -- I can't because my neurological problem does not cooperate in allowing me to hit the target with precision, dang two lines vertical & horizontal that must be accurate. I have tried for 15 minutes without any success. THERE IS NO SKIP on this. This means I am unable to finish the game. Well not able to complete the main game means no bonus chapter either. That is disappointing. Other wise I liked the game and I liked switching characters -- good creative idea. Do you think you could change Hint to a Skip so I could play the complete release? I was already thinking that this game was good enough for a replay. Rated 4 out of 5 by Kikime from ImmersiveRetroIntrigue I have so far only played the demo. I did play without checking the time and got cut off without getting to look at the extras which I usually do first, so I am wary of purchasing a collectors edition without seeing that, at least looking through the wallpaper selections. Also hidden pine-cones are not my thing and the morphing objects seem to be only in-HOP and didn't overwhelm me. Still I really enjoyed the game. Play as two characters, Mary and Aaron, choose which one you start with. They befriend another couple from the same era. I really like those outfits and hairstyles from 35-50 years ago. Everyone looked so sinister and strange, I didn't know I could trust my own character. Voice-over acting is smooth and easy to listen to. Train sound effects added to the ambiance unobtrusively. The intro was easy. It had an easy fun feel. Then everything got interesting. The hallway itself had a seeming v-shape, but I suspect it is supposed to be straight. What I liked about it was that it added the kind of illusory complexity to walking back and forth on the train that can seem like maintaining balance on a moving vehicle, if one bothers to suspend disbelief. Even though every door and panel on the train was locked, we expect that. 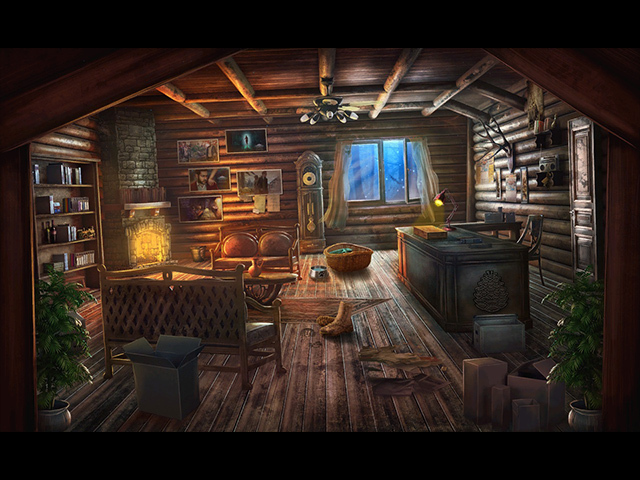 That's the usual hunt for unwritten methods to open them, keys, and lock picking puzzles, new rooms and hiding places. There were also more novel searches like wooden sillouettes for an unusual engraving that dresses the hallway and a slightly challenging (in every other way) bathroom with an emoji operated bathroom sink, a wooden toilet with problematic pipes (or is that just the train) and a very wasted wastepaper basket. Bathrooms are so useful when everything works well. There were a lot of fun multi-layered and creatively (but mildly) challenging puzzle/minigames. I really enjoyed handling the old-fashioned gravity maze. I have never bothered to memorize the rules. I also liked the easy pieces of paper puzzles and rotating wires puzzle. The Hops were few, quick, and colorful. One had words missing some of there letters as a clue. That is a great idea and it made it that much more fun. For me, the story was the best part. It is usually the most important aspect. It is well told with lots of twists and intrigue (for early in the game at least). Rated 3 out of 5 by gameidiot from Great game until target I really enjoyed this game until I got to the target. I cannot finish that, I have tried many, many times. So I can't finish the game. I really feel cheated. Rated 3 out of 5 by Lisistrata86 from Neet game but not so much fun The story was intriguing at first but later not so much. I liked how the scenes were done and the music was all right but overall, an average game. Try for yourself. Rated 3 out of 5 by syc7066 from Good but with glitches This game is good except that getting a souvenir in the town square does not make sense. There is no arrow to indicate that i can scroll to find that souvenir. Rated 2 out of 5 by peanutlee33 from Just Okay Game Play I got ten minutes into the Demo Train Ride, to realizing it wasn't for me. Just dumb elementary clues, and second-rate graphics. I was expecting a more intensive, advanced version Murder series. This game is great for beginners or those who are more into elementary level games. But not for advanced users, more inclined to intense graphic scenes, such as Ravenhearst or Dark Parables. Rated 2 out of 5 by dhealy649 from couldn't get past one of the final tasks The story & artwork are really good & I'm bummed I couldn't finish because I love old-fashioned murder mysteries. There is one scene toward the end where you've assembled a bow & arrow and have to shoot specific points on a target but it's just *way* too specific. It's that thing where you have to line up the x & y axis on the point & after you mess up a few times, it even gives you a visual guide, but you obviously have to hit it within a nanometer & I can only sit there clicking into oblivion for so long. Based on my experience & others saying they had scrolling issues with another of the final tasks, I would not recommend purchasing. Rated 2 out of 5 by Fooball from Not a fan The game itself was ok and quite fun. There was a bit too much dialogue, which slowed it down and the character changes were unnecessary. Some of the puzzles weren't explained at all well and I had to skip some of them. I couldn't access the Bonus Game at the end which was very frustrating. Rated 2 out of 5 by oO0AdATbF from This? From my Favorite Developer?! How disappointed I am that I purchased this game, albeit with a discount coupon. Love the newish BigFish logo and of course the wonderful Eipix intro, always exciting to see as it typically signals a fun and well-rendered game. This game is neither. From the increasingly annoying sounds resulting from a simple mouse rollover to the white boxes around the scenes; these deckled-edge frames look cool in print, but they act as a real barrier to immersion in the scenes. And those scenes lack the wonderful detail that I'd come to savor and rely on from these folks. New Year's Eve, so I won't be playing another game until next year. It most assuredly will be more fun than this awful entry in your otherwise excellent selections. Rated 2 out of 5 by Tink54rn from Very difficult puzzles and just no fun! I bought this game without trying it first. Broke my first rule and I paid for it. It's not worth the time to play it, honestly. The games were too hard for me to figure out and I'm good at this! The storyline was long and convoluted. Don't waste your time on this one. Rated 2 out of 5 by snowbunny1977 from Really boring I read the other reviews and decided to try the demo. Glad I did. I only lasted like 10 minutes. It was really boring and I dont like the layout of the game. Its interactive in a way and thats not my thing at all. I dont know it was a weird look when I was playing it. Didnt like it. Rated 2 out of 5 by LunaNik from Interesting idea, poor execution. I found the storyline quite engaging, especially after reaching the train station. Unfortunately, the game "solved" nearly everything for you, which reduced the challenge level to zero. The number of shaped keys and random knobs became annoying rather quickly. Like most HOPA games released in the past few years, everything was broken, missing parts, or required a medallion to unlock. 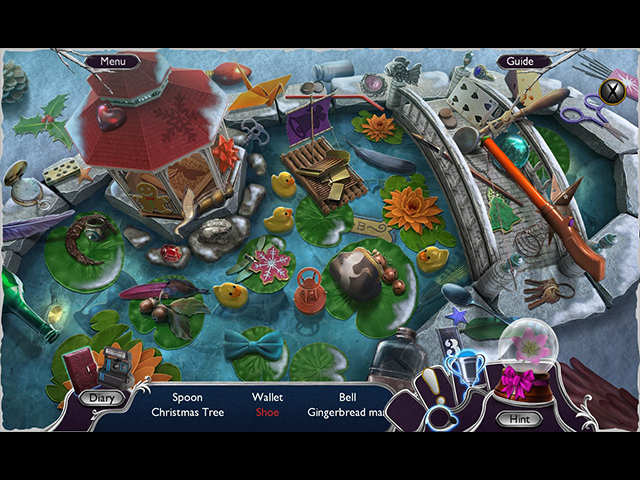 HOPA scenes showed some creativity in presentation, but were still much too easy...large objects in plain sight. Mini-games had nothing to figure out; you knew what to do the instant you saw it and just had to go through the motions. And inventory items were used in ways so unconventional, you literally had to just try each one on an obstacle. Knife to replace broken trash can lever. Silver tray used as a pry bar. This isn't innovative; it's nonsensical. The exposition nicely teased you along regarding the plot, but since the challenge level is zero, it's not for me. I like games that keep my brain sharp, that make me actually think, and that don't hold my hand. Rated 2 out of 5 by bodhico from A waste of time Too many character changes. Back and forth on the train is boring. Rated 2 out of 5 by LogieBaby from This is a memoir I'd rather forget ever reading This game has dumb written all over it. We start with the Fletchers ( husband and wife ) reminiscing about an event that occurred years ago when they won a vacation to Pinecone Lodge in New England. Why Mr. Fletcher looked many years older than his wife in the initial cut scene was the first indication of not so good things to come. The Fletchers then get on a train and meet Sebastian and Lyla Ortiz. 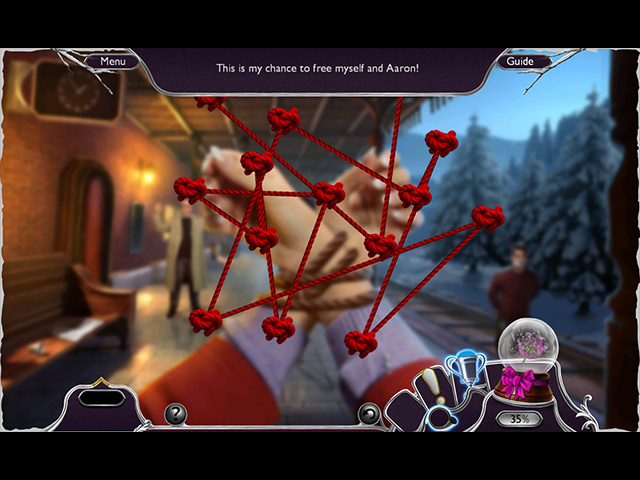 Sebastian is quickly accosted by a stranger wearing a feathered hat and Mr. Fletcher decides that he is compelled to aid someone he met less than 5 minutes prior. In doing so he must gather items to unlock doors, pick a lock, remove rust etc., all devices used way too often in way too many games. When are developers going to put on their thinking caps and give players new problems and methods to solve said problems? The train conductor is aware of the Ortiz mugging and says that nothing of the sort will occur on his train yet he's more involved with talking to a bartender than doing his job. So here we have more dumbing down of the story. Next Mr. Fletcher is somehow locked in a storeroom so the player then gets to play as the wife so she can get him out. There are more issues to resolve via gameplay. Some of the HO segments are OK while the puzzles can all be handled by a 6 year old. A bit later into the game Sebastian is found murdered and the conductor quite calmly explains that the police will be questioning the events at the next train stop. It is at this train stop that I said to myself STOP!!!! Resorting to Revenge completely lacks in originality as too many of us have seen this drivel hundreds of times and in games that make a bit more sense. As murder mysteries go anyone would be fetter off reading Christie, Doyle, Jeffrey Deaver or any one of thousands of good writers who excel at whodunits. Avoid this trash. Rated 1 out of 5 by JRNDSGMA from insane bullseye This game had it all till I got to the target and bow and arrow. As several other players have stated, it is impossible to accurately target it and it's not a puzzle that can be skipped. Why oh why would you put such a thing in, what otherwise, would have been my favorite of all times. Rated 1 out of 5 by silverfiesta from I CANNOT FINISH THE GAME I'm at the target game and I cannot get the required, unrealistic accuracy needed to get past this step. Since there is not a skip option I cannot finish the game, so I'm feeling very ripped off. Rated 1 out of 5 by rockinkittycat from Don't bother. I've played a million of these types of games, and NEVER ONCE have I left a review. This game was so terrible that I feel the need to warn other potential buyers. THIS IS THE WORST GAME I HAVE EVER PLAYED. Not fun at all, just extremely frustrating. What should be obvious is not, and what should be challenging isn't....except for that last target mini-game, which is far too challenging and has no option to skip and is nearly impossible to successfully complete. Don't waste your time and money. THIS GAME IS CRAP. Rated 1 out of 5 by cathybobcat from DOWN THE LOO WITH THIS ONE After the extremely annoying, constant pop ups taking up the screen space...the shallowness of the game with the chitter chatter and their choices...an achievement for ringing a bell too many times...and the last straw, encountering a dirty bathroom HOS on a luxury train....THAT was it for me. Down the latrine with this waste.